Žilina was an important center of Jewish life in northern Slovakia. It developed as such only in the nineteenth century, as the presence of Jews was long limited before that. The first synagogue was built in 1850 and served until 1928, when a new synagogue, designed in striking modernist style by the famous German architect Peter Behrens, was constructed. This synagogue today is a cinema, but bears a plaque denoting its original use. Following the schism in Hungarian Jewry in 1869, the Žilina community opted for the Neolog movement; Orthodox Jews eventually established their own small, separate community in 1921. Žilina has always been an important railway hub, and during the Holocaust a transit camp was established here. A memorial marks its site. There is still an active Jewish community in town, numbering about 50 members. The Orthodox synagogue is today the center of Jewish activities. Originally constructed in the 1920s by the breakaway Orthodox congregation, it is small, single-story house in a quiet residential neighborhood. The basement, once the site of a mikvah [ritual bath], is today used as a shop. The sanctuary is fully preserved with the original furnishings and decorated by typical 1920s-style geometric ornamentation. 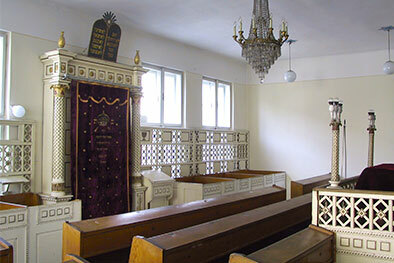 A wooden screen, or mechitzah, forms an internal division between the men’s and women’s section. In the rear, in the women’s section, a small Judaica exhibit of the Museum of Jewish Culture in Bratislava is installed. The collection includes precious ritual and other objects from pre-war Jewish communities in Žilina itself and elsewhere in northern Slovakia.